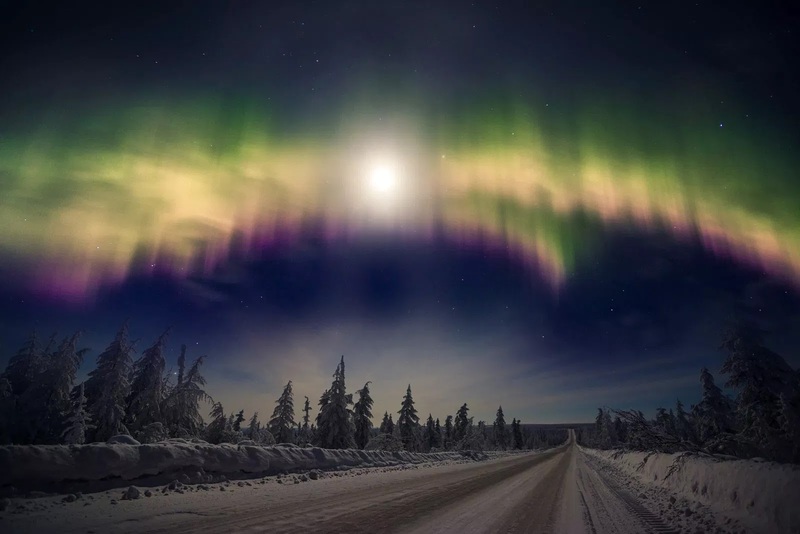 Despite being restricted to a few very specific locations around the world (more on that here), there are so many different ways you can see the Northern Lights. Sure, you’re going to have just as many incredible memories seeing them from the side of the road as you would watching them from a dogsled in Swedish Lapland. But be honest: won’t you rather watch the shimmering auroras from a private jet, a cozy igloo or from inside a climate-controlled bubble? Believe me, not freezing can help you really relax and appreciate this natural wonder. But so too can diving into a frozen lake in Finland — more on that later. From northern Norway to, well, somewhere high above the Arctic Circle, consider this your ultimate guide to extreme Northern Lights viewing experiences. Get excited. 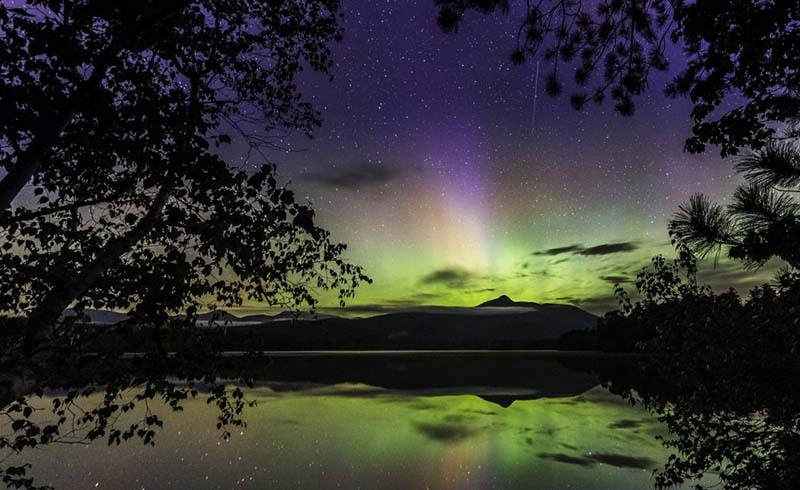 New experiences focused on the aurora borealis are constantly popping up. 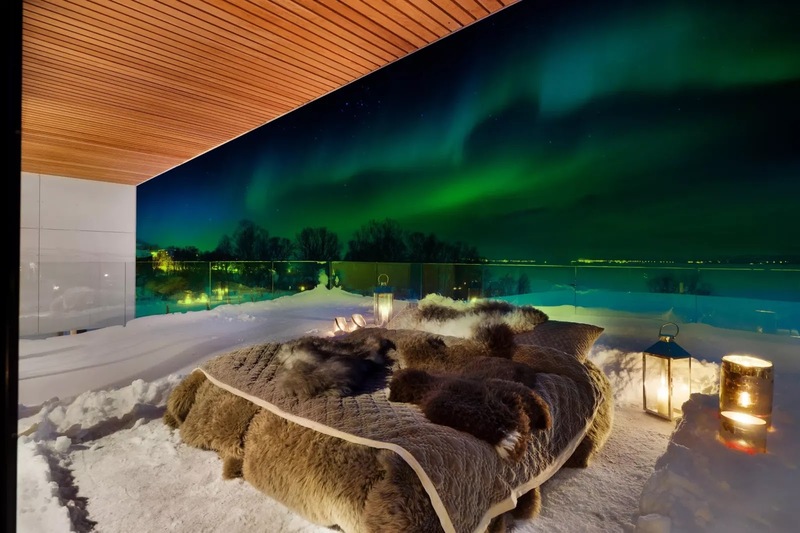 Off the Map Travel, a company focused on creating tailor-made trips, recently announced a new “Aurora in Bed” program in Tromsø, Norway where you can sleep on an open-air balcony (hopefully) underneath the Northern Lights. Don’t worry — cozy bedding and furs are provided. In additional to the unusual sleeping arrangements, guests will also have access to a private chef, a personal host, a chauffeur-driven Tesla ready to take you wherever you want at any time of the day and the option of sleeping in an indoor master suite with floor-to-ceiling windows on those extra chilly nights. The four-day experience starts at $3,089 per person, with the option to book dogsledding and snowmobiling tours. 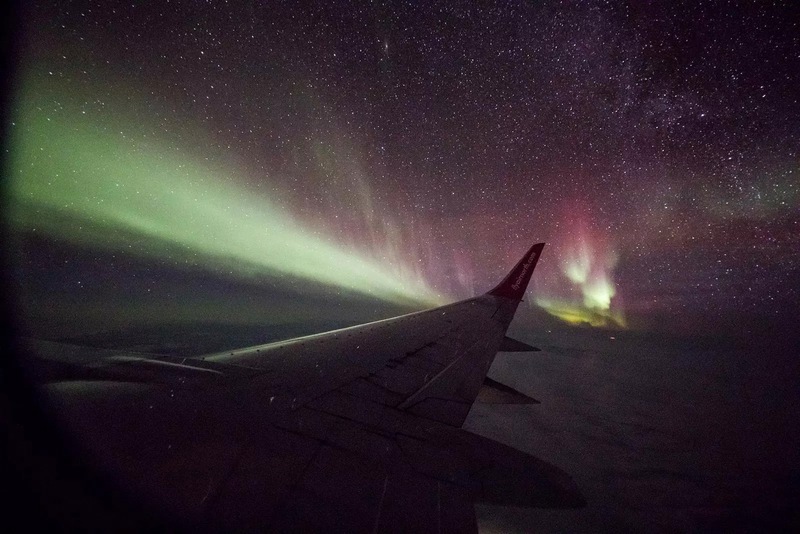 If you’re lucky, the Northern Lights are actually pretty easy to spot from a commercial airplane seat. Since you’re already traveling above the clouds in complete darkness, your chances are already better than they would be on the ground. While we have spelled out how to photograph the lights from an airplane — with some help from a seasoned pilot — here are some things to bookmark: book a window seat, keep a blanket on hand to block out any airplane cabin light from your view, and book nighttime flights to areas with high aurora activity. 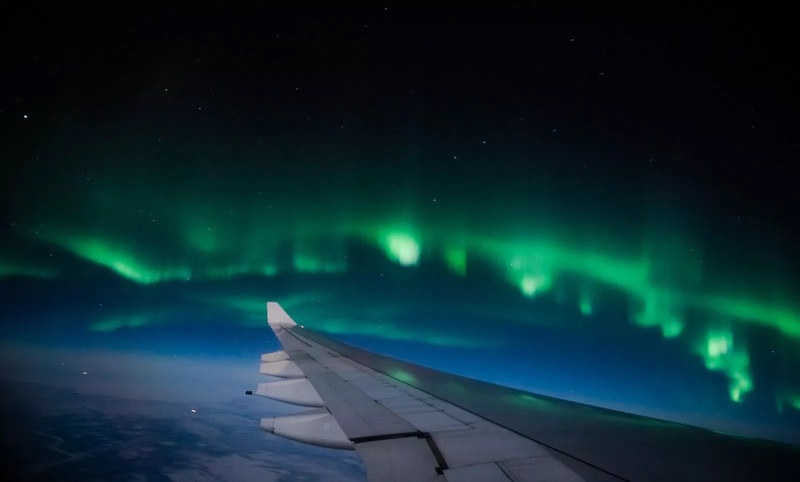 And this month, adventure travel company Consulta Meta began offering a five-day Northern Lights itinerary in Canada that includes a private jet flight high above the clouds over the Yukon Territory. If you missed your chance to book the luxe experience, watch out for a 2020 trip. It gets really dark during the wintertime in Scandinavia — like, 23-hours-a-day dark. Off the Map Travel is taking advantage of the sunless days in remote Svalbard and offering a 24-hour hunt for the aurora borealis. Aside from bundling up for a chance to catch the lights, travelers will also learn how to dogsled and explore local ice caves. This four-day experience will run you about $1,600, not including flights. The two-person domes come with reindeer skins, Arctic-worthy sleeping bags and a lamp, but there’s a communal cabin with bathrooms and a dining area. Without flights, a five-night itinerary costs around $1,300 per person, which includes one night in an igloo, three nights at the Hotel Arctic, two Northern Lights safaris, snowmobiling excursions and snowshoe hikes. Looking for something more affordable? There are igloo hotels all over the Arctic — some of which are even crafted with real snow and ice. And many are in the Northern Lights hotspots of Norway, Sweden and Finland. Rates typically cost between $300 and $400 per night. 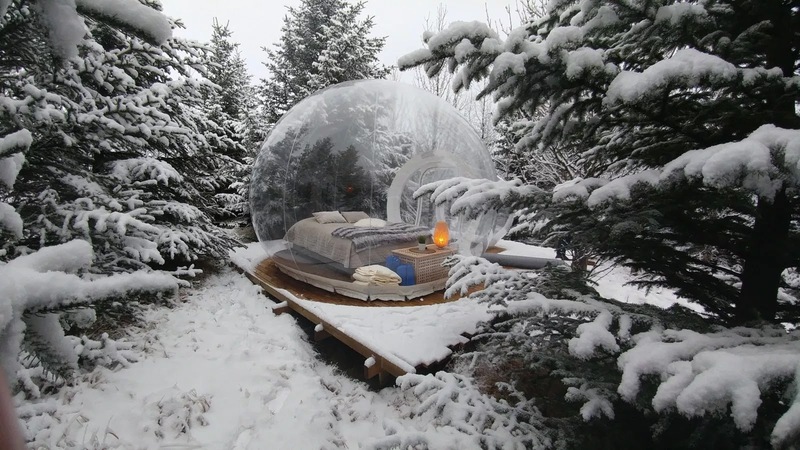 One of the most unforgettable experiences you can have in Iceland might be staying in one of the bubble rooms at the Five Million Star Hotel. (Get it?) 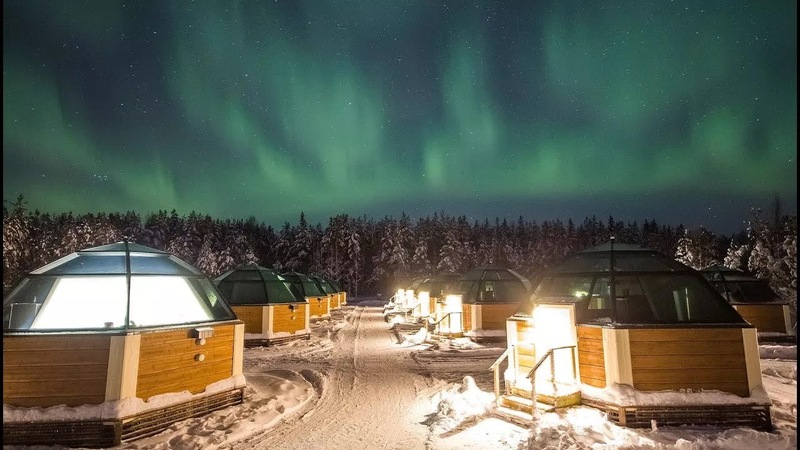 In short, the “hotel” is a collection of transparent bubbles furnished with comfortable beds, space heaters and a lamp that double as a truly spectacular way to view the Northern Lights, should you be visiting in the wintertime. Don’t worry: In a country with very little forest coverage, there are just enough trees onsite to give you a bit of privacy. In order to spend a night in one of the bubbles, you have to book a tour with the hotel. These range from exploring the Golden Circle and nearby Secret Lagoon to a tour of the southern coast that takes you to some of Iceland’s most famous waterfalls and the black sand beach of Vík. Tour experiences with overnight stays begin around $480 per person. Another offering from Off the Map Travel gives travelers the chance to float in Arctic waters while gazing up at the Northern Lights over Rovaniemi in Finnish Lapland. You’ll dress up in a rescue suit that’s specially designed to withstand the freezing temperatures. Floating in a small rectangle of open water surrounding by pack ice might just be the most relaxing way to experience the aurora. If you’re just looking to get farther from the crowds and light pollution, a hike out into the Yukon Territory may fit the bill. 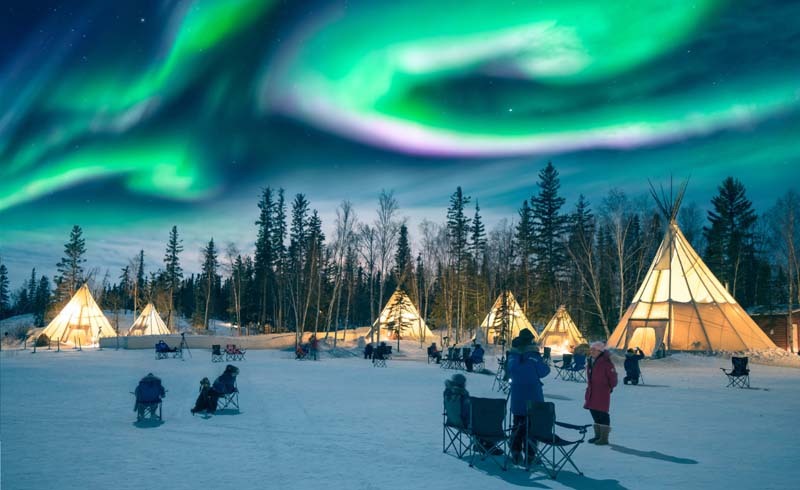 Natural Habitat Adventures will provide you with all the gear you’ll need to check out the lights from two very special places: an Aurora Pod with 360-degree views of the surrounding scenes and a plexiglass-topped (heated) shelter called the Aurora Dome. This multiday trip also includes a deep dive into the local culture with museum visits and encounters with indigenous locals. The best part: Natural Habitat Adventures is the first carbon-neutral travel company in the world, according to the company’s website, meaning the emissions from your adventure are 100% carbon offset. Prices for this experience begin at $5,895 per person.